With the advent of the 20th century came a problem for fire fighters in New York City – skyscrapers. Suddenly five-story buildings were being dwarfed by soaring structures made possible by steel-frame construction and motorized elevators. The stream of water produced by fire department’s pumper trucks was inadequate to reach high floors. To solve the problem, New York looked to the new high-pressure system in Philadelphia as a model. Within three years essentially the entire area from West 23rd Street to the Battery was protected by a similar system. A series of fire hydrants sprouted along city sidewalks and two pumping stations were constructed--one at Gansevoort and West Streets, the other at Oliver and South Streets. The stations pumped both salt and fresh water through 36-inch lines, each powered by five electrically operated pumping units. The entire system—265,000 feet of mains and 1,272 hydrants--required only seventeen months to complete. The power of the stations was remarkable; each unit discharging 3,000 gallons of sea water per minute at a pressure of 300 pounds per square inch. “What a roaring, seething, stupendous thing of might the stream from the high pressure service really is must be actually seen to be appreciated,” wrote The Technical World Magazine in March 1909. 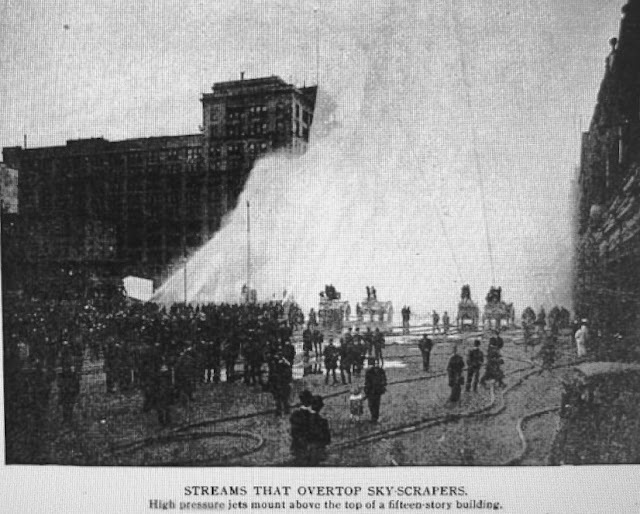 “Should the fire be in a thirty of forty-story skyscraper where terrific pressure is required to send the water to the top floor, only a pair or three hydrants need be connected with the stand pipes in the building and clear to the top floor leaps a deluge which all the engines in Greater New York could not begin to force high than three-fourths way up the structure,” the article continued. The writer predicted with “Within five years…not a fire engine will be seen within the heart of any first class city in the country.” He was referring, of course, to the pumper truck. While the new system was being installed, the Fire Department was using an old building at 226 West Broadway as a storehouse. The building had been purchased in 1856 for $9,000 and was no longer useful. A year later the department changed its mind. The new high pressure system by its very design required heavy maintenance. Falling under the joint control of the Fire Department, the Department of Water Supply, Gas and Electricity, and the Street Cleaning Department, the repair facility had been located in a street cleaning space at 7 North Street. By now the building was proving insufficient. The Committee approached the Sinking Fund Commission to get the West Broadway property back. Shepard produced a delightful four-story structure replete with emblems relating to the high pressure system. Clad in terra cotta (faithful to the mandatory fireproof quality) the façade is adorned with nearly-whimsical valves, hydrants and pipe couplings. Because of the building’s purpose it remained unscathed throughout the 20th century; immune to the alterations that normal commercial buildings endure. But as the century drew to a close, the little terra cotta facility was not longer adequate. In 1989 it was converted to two duplex apartments; then later remodeled to a one-family townhouse. The shop where pipe joints and pump parts were formerly repaired was now a four-bedroom, four-bath luxury residence that sold in 2011 for just under $6.5 million. The “little gem” at No. 226 West Broadway survives as a splendid example of utilitarian city property that managed to rise above its expected commonplace appearance. Fascinating backstory and pix of one of my singularly favorite buildings in The City. Many thanks for the posting, Tom. I've been dying to put this out there, but they won't take the darned scaffolding down from the street level. I finally gave up! Look for updated (entire building) photos at a later date!